Cotton Tale Lollipops and Roses Baby's 1st Chair by Cotton Tale Designs at Indsight. Hurry! Limited time offer. Offer valid only while supplies last. All Cotton Tale patterns are made using the finest quality materials and are uniquely designed to create an elegant and sophisticated nursery. All Cotton Tale patterns are made using the finest quality materials and are uniquely designed to create an elegant and sophisticated nursery. 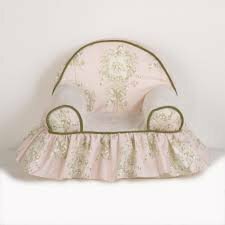 Lollipops and Roses Baby's 1st Chair is great fun for baby and a special addition for the nursery. PopLounge Expandable Foam Furniture Junior Armchair, Raspberry Pink, 26" x 20" x 20"
PopLounge Expandable Foam Furniture Armchair, Castlerock Gray, 35" x 28" x 26"